Bloomberg reports that California Credit Rating Cut Close to Junk After IOUs. 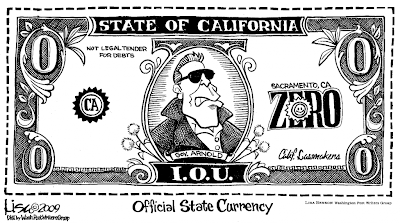 July 6 (Bloomberg) -- California's credit rating was cut for the second time in as many weeks by Fitch Ratings after a stalemate over how to close a $26 billion budget deficit forced the most-populous U.S. state to pay some bills with IOUs. Fitch lowered its rating of California's general obligation bonds by two steps to BBB from A-, placing the debt two ranks above so-called high-yield, high-risk junk ratings, and said the state may be cut further. The credit-rating company last lowered its assessment of California on June 25. California, the largest issuer of municipal bonds, last week began issuing IOUs for the second time since the Great Depression as Governor Arnold Schwarzenegger and lawmakers remained deadlocked over the budget cuts needed to make up for revenue lost because of the recession. California Controller John Chiang said the step was needed to conserve cash. "The downgrade to 'BBB' is based on the state's continued inability to achieve timely agreement on budgetary and cash flow solutions to its severe fiscal crisis," Fitch said in a statement. California, with the world's eighth-largest economy, was already the lowest-rated U.S. state. Standard & Poor's gives the state it's A grade, the sixth-highest of 10 investment levels. The firm reaffirmed that assessment on July 1. Moody's Investors Service rates the debt A2 and placed it on watch on June 19. The Fitch action affects $79 billion of debt -- $69.3 billion of general obligation bonds, rated BBB, and $9.7 billion of appropriations credits, rated BBB-. California, where the high cost of real estate fueled demand for adjustable-rate mortgages that helped trigger the recession, has been especially affected by the slump. Six of the state's cities are among the 10 with the highest foreclosure rates in the U.S., according to RealtyTrac, an Irvine, California, company that keeps data on repossessed homes. The state's unemployment rate of 11.5 percent in May was the fifth-highest in the U.S. The disappearance of jobs and spending cutbacks by consumers has sapped the sales and income taxes that fund state government. Revenue collections dropped by $13 billion to $73 billion in the 11 months through May from a year earlier, according to Democratic Controller John Chiang's office. Fitch said its rating reflects that there is little risk of a default by California [This is why Fitch ratings are more or less worthless]. Officials including Treasurer Bill Lockyer have repeatedly said the state won't default. "The 'BBB' rating indicates that expectations of default risk remain low, although the rating is well below that of most other tax supported issuers," Fitch said. The Wall Street Journal reports that Big Banks Don't Want California's IOUs. 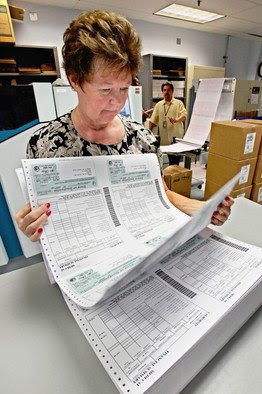 Dorothy Cottrill of the state controller's office inspects IOUs last week. The development is the latest twist in California's struggle to deal with the effects of the recession. After state leaders failed to agree on budget solutions last week, California began issuing IOUs -- or "individual registered warrants" -- to hundreds of thousands of creditors. State Controller John Chiang said that without IOUs, California would run out of cash by July's end. But now, if California continues to issue the IOUs, creditors will be forced to hold on to them until they mature on Oct. 2 [Another reason why the dollar might run into trouble at the end of September. ], or find other banks to honor them. 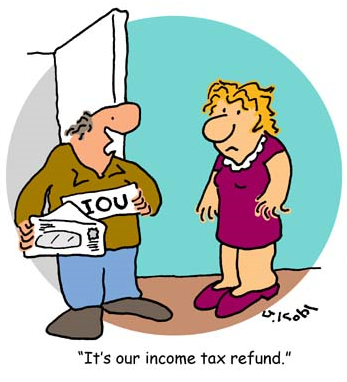 When the IOUs mature, holders will be paid back directly by the state at an annual 3.75% interest rate. Some banks might also work with creditors to come up with an interim solution, such as extending them a line of credit, said Beth Mills, a California Bankers Association spokeswoman. Meanwhile, on Monday morning, a budget meeting between Gov. Arnold Schwarzenegger and legislative leaders failed to produce a result. Amid the budget deadlock, Fitch Ratings on Monday dropped California's bond rating to BBB, down from A minus, the latest in a series of ratings downgrades for the state. The group of banks included Bank of America Corp., Citigroup Inc., Wells Fargo & Co. and J.P. Morgan Chase & Co., among others. The banks had previously committed to accepting state IOUs as payment. California plans to issue more than $3 billion of IOUs in July. Mercury News reports that California leaders in no hurry to break budget impasse. SACRAMENTO — Despite plunging tax revenues, Wall Street's unwillingness to loan the state money and billions of dollars worth of IOUs hitting mailboxes, California's leaders are displaying a seeming lack of urgency to close the state's $26.3 billion deficit. Based on projections of the state's financial outlook by Controller John Chiang, the answer may be several more weeks, if not months. That's when he projects the state will finally run short of cash to make legally mandated payments to schools and bondholders; the crunch would have come even sooner had Chiang's office last week not resorted to IOUs to lower-priority creditors like vendors. An extended delay would come at a huge cost to California's prestige, possibly sending its credit rating into junk-bond territory and driving an untold number of companies that rely on state money out of business. "We're in deep trouble in September, if not sooner," Chiang said in an interview Tuesday. Lengthy budget stalemates happen so frequently here that they are almost ingrained in the Capitol's DNA. But despite this summer's mammoth problems — and a looming deadline from the state's largest banks to stop cashing IOUs after Friday — it's looking like business as usual, with political leaders blaming one another for the standoff. "That would be like jumping into Death Valley," Chiang said. Chiang said the state can probably make it until September without jeopardizing those legally mandated obligations by continuing to issue IOUs ["Probably"? So the world's sixth largest economy will "probably" not default on its debt? How reassuring]. Chiang plans to issue $3.4 billion worth of the notes this month, and billions more in August if a budget deal isn't reached. Fitch Ratings, which downgraded California's credit rating on Monday, estimated that so-called priority payments to schools and bondholders wouldn't be at risk until late October. Further credit downgrades would make it even harder — and more expensive — for the state to sell bonds to pay for schools, roads and other infrastructure. Although budget negotiations are fluid, a deal to solve the deficit doesn't appear imminent. This week, Assembly Speaker Karen Bass, D-Los Angeles, threatened to boycott negotiating sessions with Schwarzenegger, saying he isn't serious about reaching a deal. The governor, in turn, blames what he calls intransigent Democrats for not being willing to make adequate programs cuts and farther-reaching reforms to fix the state's repeated deficits. Schwarzenegger last week called an emergency session of the Legislature to address the budget. But that declaration gave lawmakers 45 days to act before they're legally precluded from working on anything besides the budget. Meanwhile, IOUs continue to go out to vendors and taxpayers across California. The notes can't be cashed until Oct. 2, except in cases where a recipient's bank agrees to honor them sooner. California's four largest banks have agreed to do that — but only through Friday — to give state leaders a window to solve the deficit. It is far from clear, however, that top banks' refusal to honor the notes after Friday will be enough to prod the Legislature to a deal. Neither the two Democratic leaders nor a spokesman for Schwarzenegger could name a hard deadline for getting a budget agreement done. "As far as I'm concerned, we've passed the deadline," Bass said recently. "I don't know what to tell you." What's more, every day that elapses without a deal means another day the state has to pay bills based on the budget legislators passed in February — a budget that quickly fell out of balance because of plummeting tax revenues. Legislators have proposed various savings measures to help bridge the shortfall, but the longer it takes to enact those savings, the less time there will be for them to take effect. Barbara O'Connor, director of the Institute for the Study of Politics and Media at Sacramento State, said she sees a "critical window" over the next week or 10 days for state leaders to close on a budget agreement. If the end of next week passes without an agreement, "then it could go on until September," O'Connor said. And "the longer it goes on, the harder it will be to get it resolved." The huffingtonpost reports that California Cancels 2010. Sacramento, CA - California Governor Arnold Schwarzenegger announced that his state will not participate in the year 2010, and instead "will skip directly to 2011." California faces a projected $26.3 billion budget deficit, and the state's controller began handing out IOUs last week. Gov. Schwarzenegger held a press conference, following an emergency meeting with key staff and several members of the State Senate. The governor said that at that meeting, it quickly became clear that there was no alternative to canceling the upcoming year. "The fiscal emergency we now face is even worse than we had anticipated," the governor said, reading from a prepared statement. "We have decided the best option is to sit this year out, and pick up again in 2011. Hopefully, after that amount of time, and with the money we save by not participating in 2010, we'll be back on solid financial footing and we can return to the greatness that we Californians are known for. Until then, bear down and try to get through the rest of 2009. Because after that, you can sit back and relax. You won't be doing anything for a while." All state services will cease to operate, all state employees will be laid off, according to Mr. Schwarzenegger. Mr. Schwarzenegger said he regrets that his state will not be able to participate in 2010, as it "looks like it will be a pretty good year," but he said he's confident that 2011 will be a great one for California. "I hate for my state to miss out on 2010," the governor said, "But I know that when we pick up again in 2011, we will be doing it with renewed vigor and energy and commitment. 2011 will be a great year for all Californians, at least the ones who don't rely on the state for any essential services, as those people probably won't survive 2010." My reaction: All is not well in California. 1) California, the largest issuer of municipal bonds, last week began issuing IOUs for the second time since the Great Depression. 4) California plans to issue more than $3 billion of IOUs in July. 5) State Controller John Chiang said that without IOUs, California would run out of cash by July's end. 1) California's credit rating was cut for the second time in as many weeks by Fitch Ratings after the most-populous US state started issuing IOUs. The Fitch action affects $79 billion of debt. 2) California, with the world's eighth-largest economy, was already the lowest-rated U.S. state. 3) Further credit downgrades would make it even harder - and more expensive - for the state to sell bonds to pay for schools, roads and other infrastructure. 1) Six of the state's cities are among the 10 with the highest foreclosure rates in the U.S.
2) The state's unemployment rate of 11.5 percent in May was the fifth-highest in the U.S.
3) Revenue collections dropped by $13 billion to $73 billion in the 11 months through May from a year earlier. 1) California's leaders are displaying a seeming lack of urgency to close the state's $26 .3 billion deficit. 2) Gov. Arnold Schwarzenegger and legislative leaders blew past a supposedly ironclad June 30 deadline to pass a new budget. 4) By the end of July, the state will have missed $800 million in potential savings lost to the simple passage of time. B) Special interests and constituents angry about looming cuts to their programs. Despite California's rapid descent into the abyss, politicians appear committed to the path of least resistance, which involves doing nothing until California eventually defaults. Considering that a Californian default would undermine all other US government obligations and that the treasury needs to sell 3.3 trillion debt in the second half of 2009, this is not going to have a happy ending. This entry was posted in Currency_Collapse, Humor, News_Developments, Wall_Street_Meltdown. Bookmark the permalink. Thanks for the rundown on the sad state of CA economy. Much as I hate to I sorta agree with Fitch here. In the end the US is probably not going to let California default, BUT the larger problem is basically how many (states, banks, automakers) can the US bail before the country pretty much 'defaults' (or money-prints, bad news either way). That BBB is more a call on the likelihood of the US to step in and rescue Cali, however short-term that rescue may be. Essentially Cali creditworthiness is not the issue. US creditworthiness is. So Fitch is right not to downgrade Cali to junk, not while the US is still ranked 'AAA'. It's that larger AAA rating I disagree with, not Cali's. Dear Eric, there are so many news out there saying plenty of people, states, or country in need of money (USD). How can USD collapse if so many people are in such a big need of USD? California as well, they are desperately in need of USD right now, this is not dolar bearish news, is it? 1) Let California to default. A) The Californian economy collapses, which means much less tax revenue for the federal government and more expenses (more food stamps, etc), meaning the national debt would grow even faster. 2) Print money to bailout California. A) Printing money is bearish for the dollar. B) Every other state would also expect a bailout, leading to even more money printing. Dear Eric, but even if they print the money, it's only few hundred billions or few trillions only. In a world where there is hundred of trilions of dollars existing already, this only add up a few percent. Even if you are right, isn't the dollar will just decline a bit from this printing policy. Perhaps 5%, perhaps 10%, or 20%?? This is not collapsing, isn't it? The US monetary base as of September 2008 was around 262 Billion (See the Fed is planning 15-Fold increase in US monetary base). So printing "a few trillion" (on top of the billions already printed) is a huge monetary expansion. Remember, printing money doesn't instantly create inflation: there is a lag. But Eric, isn't we suppose to analyse total USD existing in the world compare to the new money printed to know how much the dolar should decrease in value? Base money is 262 billion as you said, but credit is also money. Total credit in the world could be in hundreds of trillions. Adding a few trillion doesn't make a big difference, does it? The trillions printed is not circulated to the public anyway. Most of it stays with the bank so they can maintain their capital ratio, which is deteriorated due to credit default by their debtors and declining asset price. If those new printed money doesn't go to the public hand, it should not be inflationary, should it? Jane if you're in need of dollars, wouldn't you charge me more for what you're selling so that you can get those dollars? If you saw this massive 1 quadrillion debt deflating eating up everything in the world, causing massive amounts of stores to close and massive amounts of needed projects to shut down from lack of funding wouldn't you do what you have to to stop this beast or would you stand, watch the world go barren and starve? Obviously you'd feed this beast. The beast has a stomach and hunger for $1 quadrillion worth of things and we have to give it to it or else it will engulf the planet as the total value of every product and service on earth is no where near $1 Quadrillion. So prices must rise or the world gets engulfed by the massive debt deleveraging. And unless we catch a case of what happened in that movie "The Happening" and the people of the world loose control of their self preservation mechanism, people will resort to raising prices. They will choose to destroy teh dollar over starving. It's like what I said in another blog: "what good is $1/oz gold if there is only 5oz of gold in the world? What good is food being cheap if there is no food to eat? this is what the massive debt deleveraging will do and the only way to stop it is to feed it what it wants and it's hungery for $1 Quadrillion worth of things. Now we don't want it to engulf everything on earth so before it does we have to beat it to the punch and start raising prices massively so as to satify this deleveraging beast's hunger before it engulfs the planet and causes mass world starvation. the govt. wanting to save the bond market will print larger bills to be able to make good on the debt. But this won't matter as prices will be rising faster than the govt. can print as it just said in the article Eric quoted. Prices will be rising to end the deleveraging. People will be raising prices as they see that this is what the delveraging beast wants and the beast will not be full untill it has engulfed enough things to the total value of it's $1 quadrillion hunger. So prices must rise higher than in any instance of hyperinflation history. Dear Numonic, producer can sell at higher price, but is consumer really capable of buying it? Money supply and goods price index, I believe is growing at parabolic curve, or at least significantly, this past few decades. If raising price to feed this 1 quatrillion is the only way, then what is the end scenario? We can't hyperinflate forever, can we? Now 2 years to print 10 trillion. Later 1 year to print 10 trillion. Later 6 month to print 10 trillion. ... Later 1 minute to print 10 triliion. It can't go on like this forever, right? What is the end scenario?? But Eric you said the economy will turn around in two years, after the period when we enter hyper-inflation and a collapse of the dollar. *snicker*. Seriously your credibility is going up in smoke. Your nonsensical economic calls and your pumping of the idea of ivesting in a country with high corruption and little adherence to the rule of law is ridiculous. At this point I just use this site to make sure there isn't any news I have missed. Good luck with you prognosticating. Much of it is dead wrong. Anon, it is not Russia where corruption lives, now it become US. I wish you know what Europeans think about US today, most of them are really amazed what kind of socialism/corruption is growing in States. You live in propaganda bubble. Propaganda in States is improved compared to what Goebbels did. Jane, there are still many people who can afford non-neccessities, these people can afford a rise in prices and when it comes to the point where no one can afford any more rise in prices the end scenerio is larger Federal Reserve Notes like Weimer and Zimbabwe untill all the deleveraging is sopped up. Base money has to reach hundreds of trillions to stop the massive defaults/deleveraging, this requires larger bills as the current denominations are too small to print fast enough. The dollar looses all value, credit is collapsed and hoarding is practiced and the world is better for it as more producers are born instead of killed off due to credit. Here is a paper of my prophecy. It involves everyone on earth. It involves hard work but it also involves a large reward. Here it is. 1. The Sickness: Credit/Third Party Banking/Lending. Not too much credit but credit period is the sickness. a. Ignoring the supply of tangibles compared to the supply of money, the value of credit or a bond is based on the lenders/banking systems solvency. The more solvent the banking system/lender looks the more valuable is that banking systems/lender�s bond/credit. Nothing makes a banking system/lender look more solvent than a banking system/lender that is lending/giving money out for free in massive quantities at massive speeds. This gives the image that the lender/bank has so much money that it can give it away recklessly/without care. This is why banks were lending so freely/easily and why bonds have been increasing in value over the last 30 years. b. Credit has also been decreasing the world of producers and replacing them with consumers. But because the producers were decreasing, allot of consumers began starving and poverty increased in the world. a. Over 90% of banks/third party holdings will fail at providing depositors with their money. The stock market will crash to record lows. c. 100% of people will begin keeping their money in a private place where only they and they alone know where it is. And because prices will be so high and rising, people will not be keeping paper as money they will be keeping things that are durable, hard to produce, rare, vital for producing things and divisible without changing it�s property (i.e. Gold, Silver, Platinum, Palladium, Copper etc. Metals). The price of those things will be rising the most. 5 One dollar bills will be worth more than 1 One Hundred dollar bill. The face value on the bill will not matter anymore because the value of money will be based on it�s commodity value and 5 pieces of paper has a greater commodity value than 1 piece of paper. The fiat paper currency will be in disarray because it will be based on it�s commodity value and not it�s fiat value. d. The government will create money bills larger and much larger than the current largest denomination of the money. (This means they will create $100,000 to 1,000,000,000 dollar bills. $100 dollar bills will no longer be the largest bills we use.) The govt. will do this to have enough money to stop the massive defaults/bankruptcies(these defaults being the cause for the rise in price of all tangibles, the govt. wants to keep the price of all tangibles low, so stopping the defaults is their plan) from all the debt that was created since the banking system started which totals over $1 quadrillion. That�s over $1,000 Trillion dollars. A majority of that debt was created in the last 10 years. The larger bills will be the final attempt at saving the banking system. e. 90% of companies and businesses will close down and we will have 90% unemployment. Those who are lucky enough to keep their job will receive wage cuts. People will not be able to make a living with the wage cuts and higher prices. massive de-leveraging, it�s currency will suffer because of the rest of the world�s poor manufacturing sector which will cause a sort of uncontrollable protectionism for most countries. People around the world will not be exporting because they will not have enough to export and what they used to export (their debt) will be worthless. a. Because it will be so worthless to get paid with paper, people will start demanding to get paid in things of more value. People will start demanding to get paid with metals because of all the metal�s properties. b. There will also be bartering going on and people will be trading whatever they can for goods and services. c. More people will want to work because they know that they will be getting paid in things that will be rising in value ( i.e. gold, silver, platinum, palladium) and the only way to get those things will be by working for them. d. More people will become producers instead of just consumers and there will be more things produced in the world and global poverty will decrease. More metals will be mined and producing will become easier because the metals have industrial properties that help increase the efficiency of infrastructure. e. Since people will be getting paid in things that will be rising in value, more people will be richer sooner and more people will be able to retire earlier than they would have before. This will all happen within the next 2 years. does anyone know how i can get my hands on a california iou? I searched ebay and craigslist but cant find one. says bank holiday in September to devalue the dollar. Thought it was interesting. What do you think of hoarding versus banking ? Don't you think that a full reserve banking is better than hoarding, for it allows the real money to be better allocated than just hoarding ? here is more on the Chiasso bonds.
. . . politicians appear committed to the path of least resistance, which involves doing nothing until California eventually defaults . . .
Nobody knows what to do so they are doing nothing . . . nuff said. I think you are missing important issues. 1. You like to use the Germany example, in which currency in circulation increased 50% prior to inflation. But in the US it has only increased from 0.83T pre-quantitative easing to 0.91T today. 2. There is 3-5 trillion credit destruction during the current crisis (lowering size of ABS/MBS, CMBS, Agencies, consumer loans, and other whole loans). Credit is money supply in the current system. 3. Fed's printing of 1 Trillion is only a small fraction of it, barely keeps up with the trillions of money supply reduction from credit. 4. The US monetary base as of September 2008 was 860B rather than the 260B as you mentioned. 5. Recession leads to lower money velocity and excess capacity and high unemployment is deflationary. A retired trader from a global PE shop. Once money is loaned, credit is not part of the money supply. CDOs and other derivatives that were essentially credit have been trading at only a few cents on the dollar. Stuff that trades at a few cents on the dollar is not money. Or did anyone ever see real dollars trading at a couple of cents on the buck? Here for credit reduction I mean the lower lending activity as well as loan and bond issuance, rather than the asset writedowns. Money supply from credit is created when the money is being lended, a bond being issued, or an ABS/MBS being structured. Banks don't lend because yields are not high enough as collateral prices continue to drop (besides that they don't have sufficient capital and that they are deleveraging). Same for bond/debt issuance. Fed print against the drop in money supply by this credit reduction, as well as the drop in money velocity during the recession. Inflation is their long term goal, because Feds want to 1. dilute US liabilities 2. benefit their Wall Street buddies as the first inline for purchase power, but deflation is what they need to fight against before this. Dollar also will go down in the long term especially against BRICs, as to restore structural trade balance, but the current pace of printing is not yet at the level to cause hyperinflation which Eric and you think would happen. In fact our self preservation mechanism is running and has been running. The act of laying off employees to cut the cost of paying those employees as a means to try to have enough money to pay the rising borrowing costs is the same as raising consumer prices because both are a means to the same end which is to try to have enough money to pay rising borrowing costs to stay in business. As soon as enough people realize that the means that they are using to reach that end is failing(layoffs) they will include other means(raising consumer prices). If we didn't have the self preservation mechanism, we wouldn't be doing these layoffs or printing dollars to stop defaults we would allow the defaults to happen unabated and wouldn't care if someone defaulted on their payments. If we didn't have this self preservation mechanism, we wouldn't care if the banks refused to pay out our deposits. We would allow them to default and continue to do business with that bank that just defaulted on us. We wouldn't care if we didn't get paid for working and would starve because we would allow inventories to be wiped out without doing what is needed to restore inventories. But like I've said, everything happening suggests the opposite and our self preservation mechanism is still very much intact. You have to understand that the debt deleveraging is/will be eating up supply just as much as trillions of trillion dollar bills circulating the economy would. In fact the debt deleveraging would eat up supply in a greater quicker fashion than printing massive dollars would because the debt deleveraging is electronic while the printing is tangible and electronic moves faster than the printing press even if you are increasing the denominations of the bills massively because if the majority of the bills in circulation are these extremely large bills it will make it hard to do transactions and this means more defaults(Unless prices are risen so that the demand for unavailable change for those large bills is decreased). And we can't continue to print these small denominated bills because we can't print them fast enough to stop the massive deleveraging and we can't print a boat load of larger bills or what I just said about transaction problems and defaults would happen. So massive defaults are inevitable unless larger bills are created and unless prices rise. This is another false idea. The problem is not that loans were made to uncredit worthy borrowers, the problem is credit period. And Full Reserve Banking is an oxymoron. When you put money in a bank even if that bank is practicing full reserve banking, you've just created credit(Fractional Reserve Banking) because now "your" money is in more than one possession. "Your" money is supposedly in your possession and also in the possession of the people in the bank who can touch and hold your money in their hands. Possession is 9/10ths of the law. Who really owns the money? You or all the employees in the bank who can get their hands on your money? So common definition of Full Reserve Banking is an oxymoron. True Full Reserve Banking is hoarding.
" True Full Reserve Banking is hoarding." I see your point, and I agree. But one problem of hoarding is the risk of violent theft, which is quite a certitude for the times ahead. It may be worst to have your savings violently stolen by a theft than quietly by a bank. I'm French, and throughout all French history violent theft of private gold hoards accured at each time the central state has been into big financial/political troubles. I wonder what our "modern" societies would become if precious metal hoarding should spread among middle classes. No matter how many guns you may have in your home, it will never be enough to stop all these future starving unemployed thieves. Especially when the state and its police go bankrupt, and moral values are disregarded by all. Therefore for this very simple reason, widespread hoarding just seems impossible to implement. And how would companies do for international payments ? Banking really seems to be necessary. A full reserve banking strictly controlled by the state being maybe the 'least bad' form of banking. I think the middle class already hoards precious metals. I saw a stat somewhere saying that there are over 2,000 small silver investors with over 1,000 ounces of silver. Do you really believe all stimulus dollars are created on paper? None digital? Martijn, i ask you what is the point of a bailout? Why is credit contracting? The point of a bailout is to stop a default. A default is an inability to give out promised money. And what would cause a default? The answer is an inability to give out physical cash. One can't default on digital money because all that is needed to give out digital money is to type the number in to the computer and the only way there can be a failure to do that is if the banks couldn't find someone that was capable of using a keyboard. The banks are not short of people who are capable of using a keyboard they are short of physical cash. I know physical cash is only used in a minor part of daily transactions but because credit expanded so much, that 1% of 100 people that use cash turned in to 1% of 1,000,000,000 people and greater. So even though the percentage of daily transactions stayed the same, the number of those transactions grew stretching the dollar thin. Maybe I'm just not a big spender but i use physical cash allot, allot more than credit/debit. But it makes no sense to say some of the bailouts are deigital/electronic. How can you even explain that? Does someone from the Fed come in to the commercial bank and press the 0 key a few times to add to the banks balance? First of all why can't someone at the bank just do that and second how does adding money digitally to banks account make the bank go from insolvency to solvency? What was the bank insolvent of? people who can use a keyboard? No the banks are insolvent of physical cash and that's what the bailouts are physical cash. If there was a great number of private gold hoards stolen then that gold hoard was never private to begin with. I disagree that riots and looting will last much long, first of all it will be the deposed govt. 's and banks that will be inciting riots and looting. The deposed govt.s and banks want you to believe that the end of credit is the end of the world when nothing could be further from the truth. The end of credit is the ressurection of the world, a world held from growing due to credit. The end of credit will be the beginning of prosperity for the world. Credit is riot and looting as all credit is is taking what you didn't work for. The end of credit will not cause rioting and looting, it will end it. There will be some spark and propaganda of rioting and looting by the deposed govt. 's and banks but in truth people will realize that they have to buckle down and work for what they want. Rioting and looting only leads to shortages and one can't steal what is not there. And this is where credit has brought us, to a world in shortage, not internal shortage but external shortage where all the above ground supply is depleted and there is no one willing to work to get the supply underground. When credit ends, there will be more people willing to do this because they will be forced to as there will be nothing to loot unless it is brought up out of the earth first. "And how would companies do for international payments ? " The same way we ship things from one country to another. mr. pinnion I take it you haven't seen the Zimbabwe gold for food video. i m not saying people will work for nothing.I am saying they will work for a lot lot less than they do now. Just like they did in germany, just like they do in zimbabwa. So you're saying working for Zimbabwe dollars is not the same as working for nothing. What work is actually worth the Zimbabwe dollars? Come on man, people are not stupid. They will not do work that is not worth the pay. Why do you conclude that the only options are getting paid with worthless paper or starving? That's silly. In fact the reason the paper is worthless is because people demanded more of it for their work. The very action of rising prices is proof that people want to get paid fairly for their work. So people will demand to get paid fairly for their world as they will already be doing it by raising prices. The move to demanding gold/silver is no different than raising prices on what they sell. It's all to get paid fairly for their work. Now we have instances where the people of Zimbabwe are demanding gold for their work, I'm sure you'll find the same happened in Germany. Eric, can you fix this page, the margin is cutting off the replies. Deleted and reposted this comment. Links were breaking layout. Debt deleveraging beast eating up supplies just as massive dollars flooding the economy would. Wage cuts to cut costs and save money to pay borrowing costs. Rising unemployment rate shows this is not enough, money must be made other ways and the only other way is raising prices wiping out those that can still afford non-necessities and printing larger bills when we're all reduced to only necessities. I was thinking it about and believe elitists already considered risk of loosing the faith in govt./money because of hyperinflation consequences as numonic suggested. They will not allow such precarious situation and they will rather press reset button before hyperinflation takes the ride. Many US citizens will welcome devaluation due to their mortgages/debts or simply they are poor, the others will be convinced in the name of social peace (anyway why to care much about the others). For China nothing changes, Chineses know dollar is already useless. Devaluation compared to hyperinflation gives govt. more power. They will call slogans like transition to new fair banking, more regulations, pension/health care system and so on. Banksters are happy, they can start again with clear sheets. Stibot, what is this "reset button" you speak of? How can we we erase all this debt and save the currency at the same time as you are suggesting? It seems you assume that we must only devalue our currency a little to solve our debt problem. That's totally wrong. To stop this deleveraging, we are going to have to print bills larger than those in Zimbabwe and prices will have to rise more than in those in Zimbabwe. The devaluation that needs to come to wipe out the debt is far more than it seems you think it is. Yes i have seen the video you refare to. Spending all day panning for gold for a loaf of bread is working for next to nothing in my book.Anyway, where the hell are a big city full of people going to pan for gold? What will happen in USSA is food rationing soviet style.And to get your ration you ll need crappy state paper"
You don't get it. Rationing will come to an end. Credit is Rationing. There will not be enough food to fix the price. people are not stupid, they will not give away their last piece of food for the same price as the rest of their food. Proof that this won't happen is in the rise in prices. Prices rise because people demand more for their goods and services. So people will already be in the mind state of survival, they will already be in the process of demanding more for their goods and services and the step of moving to demanding gold/silver is no different. Raising prices on goods and demanding gold/silver for goods is the same thing. If the first thing is happening the second thing will follow. The fact that prices are rising is proof that people are choosing to destroy the dollar over starvation. You seem to not understand that rationing is proof of price fixing and price fixing leads to shortages. To assume that there will continue to be rationing/price fixing is to assume that people will choose to give away their last piece of food easily(buy selling it cheap) effectively starving themselves. The action of raising prices and rationing contradict each other. Prices would not be rising if people were choosing to ration/price fix. You either have price fixing/rationing and starvation or you have prices rising no rationing/price fixing and no starvation. I'm not going to sell you my item which is in shortage for cheap just to help maintain the value in a piece of paper with writing on it. Again i ask what is the point of selling food for cheap if there is a shortage of food or no food to eat? You are basically choosing to starve just to say the piece of paper you are holding has value. No one is stupid enough to do that. When starvation hits, starvation will take over and people will choose to NOT starve to death than help maintain the value in the pieces of paper the govt. calls the currency. And a move to gold/silver as money is just the next step in that. In fact rising unemployment is the same. Rising unemployment, rising prices and a move to demanding gold and silver as payment is all to meet the same goal. Survival. Layoffs are a mechanism to cut costs in order to have enough money to survive and so is raising prices and demanding gold/silver as payment. First we'll have massive layoffs and when that is not enough, then we'll have rising prices and when that is not enough then we'll have the govt. print larger bills and then when that is not enough then we'll have demand for gold and silver as payment. All of these actions are to raise enough money to survive. Oh and as far as the work to get gold for food. It will become easier and easier as gold is more rare than food and will be rising in value. The video is only the start of the move to demand gold for food and as time goes on because of gold's rarity, less gold will have to be panned and less gold will get you more. How can we erase all this debt and save the currency at the same time? I'm not suggesting that, dollar is past.. Since US (UK) have their own currency, they have ability to devalue (rather than default or hyperinflate). I imagined devaluation like 1 till 5 new dollars for 100 old ones. Since US (UK) have their own currency, they have ability to devalue (rather than default or hyperinflate). I imagined devaluation like 1 till 5 new dollars for 100 old ones." I have no idea what you just said here. I really can't understand what you're saying here. So how can �devaluation� take place? Simple. Government could announce the imposition of a brand new currency (say, the Amero, or maybe United States Notes or some kind of �pink� or �brown� currency) each one of which would be declared to be worth, say, five (or maybe, ten) of our current Federal Reserve Notes. If the gov-co suddenly imposed a new currency (say, U.S. Notes) with a value of five FRNs to one unit of the new currency, the new price of gold in terms of the new currency would be one-fifth the current price of gold as denominated in Federal Reserve Notes. That's no different than what I've been saying about creating larger bills. Doing that is no different than creating a $1 billion bill. Just because you call that $1 billion bill 1 Amero makes no difference. But as I said this will fail because at some point the money is going to be based on it's commodity value and a $1 billion bill will be worth just as much as a $1 bill. Plus creating so many large bills and not enough small bills will cause transaction problems and more defaults. What you're suggesting is no different than what is happening in Zimbabwe and look how well it is working out for them. And i know it's just an example but it's not practical since we already have bills that are worth 5 federal reserve note bills. Our largest bill is worth 100 Federal Reserve Note bills. Like I said before the bill that will need to be created to stop defaults will have to be allot larger(i.e $1 billion bills). Also the suggestion that the price of gold would stay the same as the money increased in size is rediculous and shows a lack of understanding of supply and demand fundamentals. If $1 billion bills were floating all around the economy I'm sure gold wouldn't remain at $900/oz. No, the game is over and there is no way around it.